The Harvesters volleyball team huddles in celebration after their 2017 national championship winning game. Their championship was the first for a women’s sport in Eastfield history. The squad will return to Rochester Nov. 6 in a fight to defend their title. Et Cetera file photo. The Harvesters (9-1) are in Rochester, Minnesota, to defend their 2017 volleyball national title. The team will play their first game Nov. 8 at 6 p.m. The opponent is yet to be determined. Find all the essentials to enjoy the game from Rochester or in your living room here at Eastfieldnews.com. The Et Cetera’s James Hartley will be in Rochester to bring you updates on all the action. For live updates watch James on Twitter, @ByJamesHartley, and The Et Cetera on Facebook, Twitter and Instagram, @TheEtCetera. James will be live tweeting from practice and matches. The Et Cetera will share tournament stories from eastfieldnews.com on Twitter and Facebook and photos from each match on Instagram. Matches can also be live streamed at njcaatv.com. This national tournament schedule is dependent on the Harvesters winning each prior game and may change. 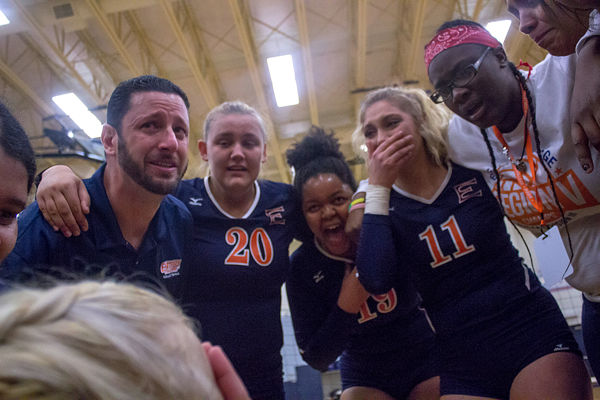 Match 3/Owens (Championship match) — Nov. 10, 7 p.m.
Eastfield’s championship-defending volleyball team (9-1), is recognizing its full potential heading into the national tournament, head coach Brandon Crisp said. Last year’s Harvesters were undefeated in conference play, but Crisp said it’s been a rockier road this season. Before the season started, Crisp said this year’s Harvesters had the potential to be better than last year. They’re beginning to live up to that now. This year’s Harvesters are third in the nation in kills per set and are ninth in digs per set. The Harvesters have had four Dallas Athletic Conference Players of the Week and two players recognized nationally this year. The Harvesters went 9-1 in conference play this season, with sophomore libero Maura Munoz ranking eighth in the nation in digs and sophomore outside hitter Keishla “Kiki” Reyes ranking 17th in kills. The No. 3 seeded defending national champions will first play the winner of a match between Northampton and Lorain County. It’s only the team’s fourth trip to the national tournament. Last year they collected Eastfield’s first women’s national title. Crisp said that the team knows it won’t be easy to repeat as national champions. The national championship tournament brings new challenges: a different size serving space, uncertainty of what to expect from unfamiliar teams and a longer tournament that could affect the team’s energy. Munoz said the anticipation for nationals changes the intensity the squad feels in practice and in games at the tournament in Rochester, Minnesota. Reyes, last year’s national championship MVP, thinks being in Rochester will give the team more motivation and help them play to the best of their ability. Middle blocker Chloe Hope said the past few weeks have built up her confidence in the team’s ability to repeat as national champs. The national championship fight won’t be any easier, Crisp said. 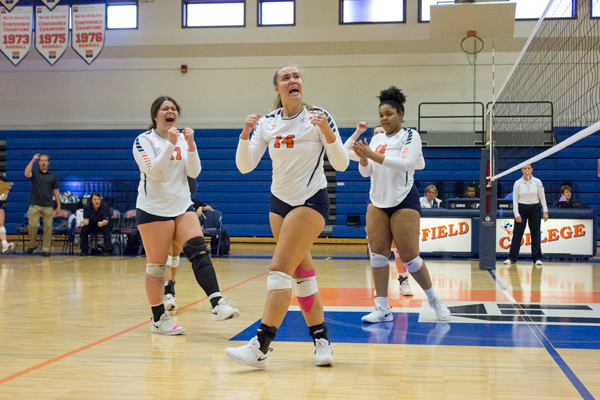 Eastfield’s team size — 19 women compared to last year’s 15 — has provided more competition during practice and more opportunity to build their skills and compete with each other for starting positions. Sophomore setter Kalli Caddell said that has made a big difference. Hope said that competition between teammates has created an atmosphere where the whole team is fighting to be the best. It’s strengthened without hurting the family vibe the squad strives for.